I know, it can seem a little bit early to be thinking of February and Valentine’s Day, but it seems to creep up on me so quickly so I like to think ahead, especially when it comes to gifting for you guy. I usually have an idea in the back of my head of something that I know he would love so it’s all about picking the perfect one. Last year, I went for cheesy and romantic and got him a customized throw pillow that was covered with Instagram memories of us, from our first concert together to our first weekend away. Totally cheesy, but I love giving it a look when I’ve had a hard day so it’s like a little gift to me too! This year, I think I want to focus on something that goes along with his passions, like photography or food. 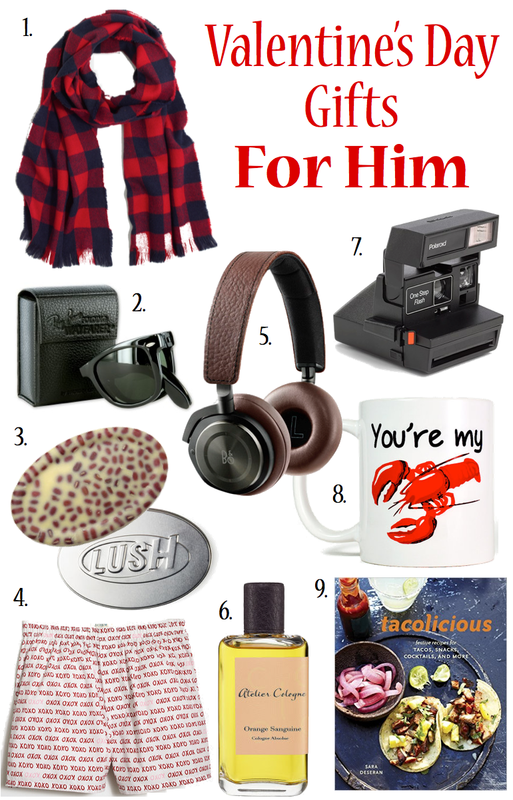 I think you also can’t go wrong with getting him something he’ll use everyday like a coffee mug, cologne or scarf. Every time he sips from that mug or smells that cologne, he’ll think of you. Such cute ideas! Definitely using this for my boyfriend!! Love your blog btw! Great ideas! I love LUSH products (the bath bombs are incredible) and my husband is always trying to steal them from me. No more! The LOBSTER mug!! I tell him that all the time!! I love this, thank you for sharing! Now I have some great ideas!! Love that lobster mug. Great ideas! These are all awesome! We don't do Valentine's Day gifts, but these would be fun for other times when we do exchange! What a great collection of gift ideas for him. Love the mug! These are such cute ideas. I've been trying to decide what to get my hubby this year. He would love the headphones. I'm not sure what to get my fiance this year so this will definitely help. Love the scarf and the camera so much!! I also just bought the Tacolicious book for our future date night at home. It's super fabulous! Great ideas! I love that majority of these are under $100!